I was delighted to receive some pieces in Fiesta’s Peppermint pattern as a gift many years ago. I got four luncheon plates and a large round platter. 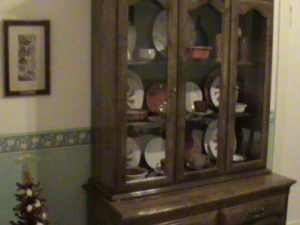 I paired them with Fiesta Scarlet and White in 2011 for the dining room Christmas theme of “Visions of Sugar Plums”. Sorry for the poor photograph quality; I used the camera option on my camcorder and it isn’t that great!